1969 Ford Mustang Mach 1, Factory R-code SPECIAL order paint car, Originally Dark Gray Metallic with White Interior ! Ford Color code Z and M2044. This is an extremely rare find. Fully documented both by Marti and a nationally known MCA Concourse Judge., this IS the real deal. Also worth noting is this car is a double R-code, meaning it was built in the San Jose California Plant, along with being a factory R-code car as well. Originally equipped with the legendary 428 Cobra Jet and shaker hood with Ram air, other options were the C6 Automatic, 3.50 Traction lok rear end, Power brakes, AM/8track, Tinted glass and Tachometer. 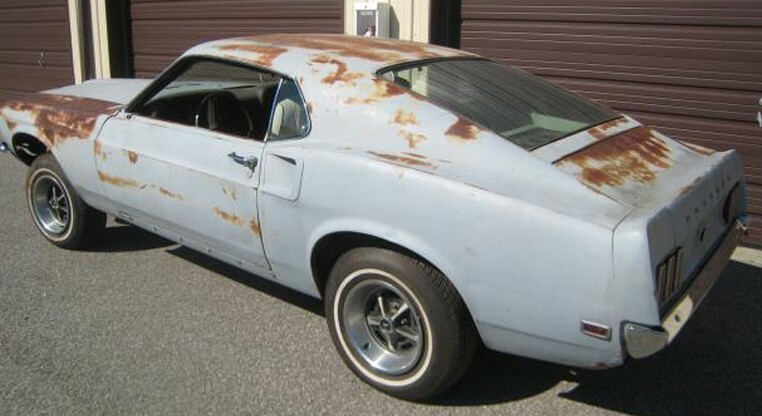 The condition of the car is better then most I find, it will be a great car to restore and one that wont need a lot of metal work. But the key to this car is the original paint scheme. If you picture the car freshly restored with the original dark gray metallic and white interior, this car will be awesome! After following these cars for over 30 years and personally looking at thousands of them, I can honestly say ive never seen one in this color scheme. It will resemble a sort of Elenor look to it without being a custom knock-off like so many of the clones and replicas out there. More pics and info coming soon.